Moments of Mommyhood: Sticking Together! Last week I turned 35. Not a monumental milestone, but it got me thinking non the less! I realize that sometimes life creeps up on you and you sometimes get the sense that you have no idea how you got where you are. I love sitting around to reminisce with my family. I look back fondly at watching my kids grow up and all the incredibly funny times we have had. I NEVER look back with regrets. We have not always had an easy time of things. But, we would not be who we are without those bumps in the road. I value the time I have with my family. I want my kids growing up knowing the same love and support that I had as a child. If someone in the family needs something, we are there. That is how it should be. Supporting each other through thick and thin is the way we live our lives. My family will never let me fail and I am grateful for that. In that late night hours of my birthday, the fire alarm in town began screaming. It did not stop. I knew that it was something big. People were seen running down my street and I had to go check it out. I threw on my clothes and headed out into the night. Large billowing clouds of smoke were seen hanging over our tiny town. My son called me and said that the garage down the street was on fire. The garage is owned by a family that I have known all my life. The owners grew up with my father and they were very much like my own family. Thankfully no one was injured, but the business was a total loss. The next morning after picking Felicia up at preschool we slowly walked toward the place where we frequently dropped off our car for repairs. I wanted to show my support and offer my condolences for their loss. This was their life. As I edged my way past the barricades, I could see the family all together. As I approached them, it struck me how they were all smiling. In the face of something so devastating they were there together. With smiling faces. Not feeling sorry for themselves. They came to work that day! There was little they could do, besides sweeping up some bits of their charred business off the sidewalk, but they were there together. Moving forward. Things like this always make me want to reevaluate my life. Am I living the way that I want to be? I think I am. Sure I have conflicts sometimes. Will we have that last baby that I have been wanting? Will I go back to work soon? Maybe I won't find a job! What would I do then? Mike and I have faced many challenges in our years together. We have always made it through them with lessons learned. I am sure that in the future there will be more, but the one thing that I know I will always have is a very loving and supportive family. We stick together and for that I am truly blessed. What an enjoyable post to read. I think it's a good idea to ponder whether or not we are really living our life the way we want to. Not as far as material things but as far as our attitude. Because really, we can lose every THING in life. And in death we will. But we get to keep all our experiences, the relationships that we have with people, our perspective, what we learn. There are some really important meaningful aquisitions in life and none of them are THINGS!! I think you definitely have an attitude of happiness! Great post! In the end, your family is what matters most! Happy Belated Birthday, Sandy! Forgive me if I'm repeating myself! You are so right, family is most important and one thing we should never take for granted! I have been trying ALL morning to comment on your blog. I don't understand why it won't let me!! This was a BEAUTIFUL post Sandy!! Family is the most important thing. If it weren't for them--where would we be? Happy late birthday! What a beautiful post. Hope you had a wonderful day! I am going to be 36 in November. Seeing the age seems surreal - I feel much younger on the inside (not that we are anywhere close to "old"). Loved your post! Good post, Sandy. Sometimes, I forget how blessed we are as a family. I may wish for this and that, but when I come right to it...I am truly blessed. Hi. Thanks for the warm welcome. Happy belated birthday. And yes, families are a blessing. A great post Sandy!! We all need to think about our lives and stay on course!!! Hugs and belated HAPPY BIRTHDAY!!!!! Thanks for reminding me of what is really important! Material things can be replaced, though it may be hard to lose them. If you don't have family love and support, you have nothing. Love your post! Yup, family is all that matters. Stopping by from SITS! Family is so fantastic, that is the power of love and life. That is what I love about life! We have plans, we break plans, make plans, and then reevaluate and create new plans all over. Sometimes things screw up our plans, but we just keep plugging away with our family and with love. Great post! Thanks for stopping by too! 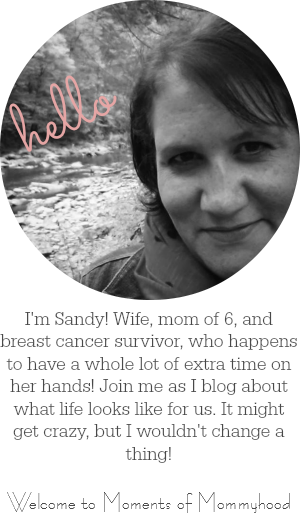 Thanks so much for visiting my blog and I'm so glad to be part of the sistahood! Thanks for stopping by my blog and welcoming me to SITS. Happy Birthday! Thanks for the reminder of what's truly important. Family sticking together is a real gift we can give to our kids. Thank you for that post, what a perfect reminder of what is important in life!